Email or Call Deb Cochran, Store Manager for more information. Furniture at the Firehouse accepts donations in good condition such as: collectibles, furniture, lamps, home décor, glassware, art and unique decorative items. Donations are tax deductible. The St. Barnabas Free Care Fund has provided more than $100 million in charity health care and residence to generations of elderly and physically challenged men and women for more than a century. 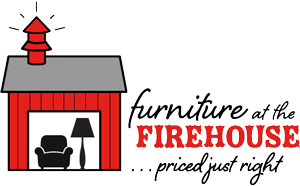 Including proceeds from all sales at Furniture at the Firehouse and The General Store. St. Barnabas Charities engages in innovative methods to raise money such as June and September Golf Opens, the Free Care 5K Run/Walk in August, Ladies Day Out in October, Founder’s Day Celebration in April, as well as Rudolph Auto Repair, Conley Resort & Golf Club and Suncrest Golf & Grille. You can also donate directly to the Free Care Fund at StBarnabasCharities.com or call 724-625-3770. Reuse Matters – for the environment! Reuse keeps goods and materials out of the waste stream, while creating an affordable supply of goods that are often of excellent quality. Reuse also saves money in purchases and disposal costs, and brings material resources to individuals and organizations that may not be able to afford them. More than 15 million tons of used textile waste is generated each year in the United States, and the amount has doubled over the last 20 years. An average American throws away approximately 80 pounds of used clothing per person.